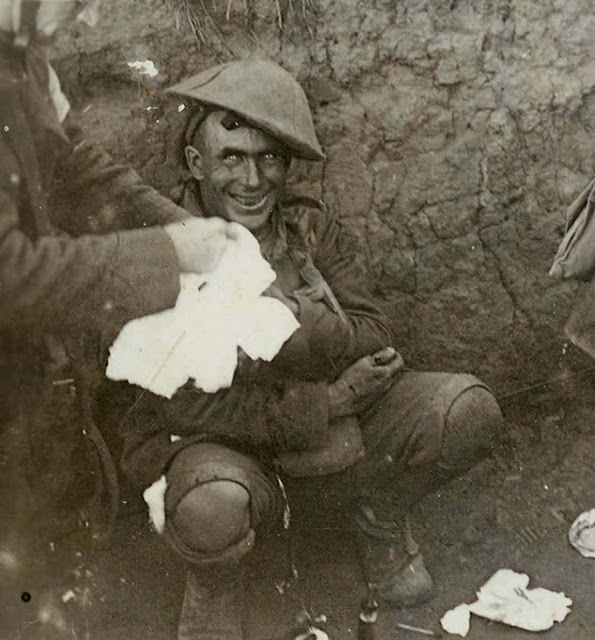 Shell shocked soldier in a trench during the Battle of Flers-Courcelette during the Somme Offensive in September 1916. His eyes express the madness of the war. The soldier looks like he has gone insane from what he has seen. In that moment in time everything he’s been raised to work within, the social constructs which make up every part of his life just exploded and shattered to nothing, and he’s lying there, slumped in a trench, afraid for his life, hearing and seeing death around him, his entire psyche broken. Even more haunting when you think that people didn’t smile for the pictures back then. The circumstances of the First World War pushed hundreds of thousands of men beyond the limits of human endurance. They faced weapons that denied any chance for heroism or courage or even military skill because the artillery weapons that caused 60 percent of all casualties were miles away from the battlefield. The term “shell shock” was coined by the soldiers themselves. Symptoms included fatigue, tremor, confusion, nightmares and impaired sight and hearing, an inability to reason, hysterical paralysis, a dazed thousand-yard stare is also typical. It was often diagnosed when a soldier was unable to function and no obvious cause could be identified. “Simply put, after even the most obedient soldier had enough shells rain down on him, without any means of fighting back, he often lost all self-control”. While the term shell shock is no longer used in either medical or military discourse, it has entered into popular imagination and memory, and is often identified as the signature injury of the war. Shell shock would later be called “war neurosis”. It’s similar to but not the same thing as PTSD. Like in the case of PTSD, mental stress leads to dramatic physical difficulties. 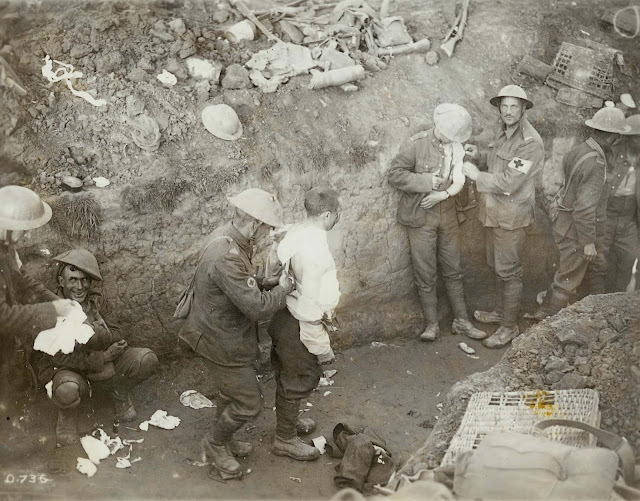 Medical orderlies tend to the wounded in a trench during the Battle of Flers-Courcelette in mid-September 1916. The man on the left is suffering from Shell Shock. Some men suffering from shell shock were put on trial, and even executed, for military crimes including desertion and cowardice. While it was recognized that the stresses of war could cause men to break down, a lasting episode was likely to be seen as symptomatic of an underlying lack of character. For instance, in his testimony to the post-war Royal Commission examining shell-shock, Lord Gort said that shell-shock was a weakness and was not found in “good” units. It’s unclear how many were shell-shocked and convicted of cowardice or desertion when they really were insane. Later the British government gave pardon to the soldiers executed for cowardice and desertion, in this way officially recognizing the shell shock effect the war had in its troops. The Battle of Flers–Courcelette (15–22 September 1916) was fought during the Battle of the Somme in France, by the French Sixth Army and the British Fourth Army and Reserve Army, against the German 1st Army, during the First World War. The Anglo-French attack of 15 September began the third period of the Battle of the Somme but by its conclusion on 22 September, the strategic objective of a decisive victory had not been achieved. The infliction of many casualties on the German front divisions and the capture of the villages of Courcelette, Martinpuich and Flers had been a considerable tactical victory but the German defensive success on the British right flank, made exploitation and the use of cavalry impossible. Tanks were used in battle for the first time in history and the Canadian Corps and the New Zealand Division fought for the first time on the Somme. On 16 September, Jagdstaffel 2, a specialist fighter squadron, began operations with five new Albatros D.I fighters, which were capable of challenging British air supremacy for the first time since the beginning of the battle.